Growing up in the African country of Togo, Mansour Ourasanah knew what it was like to be hungry. But he assumed that limited food was a universal misfortune, like a head cold or a broken heart. Eventually he discovered that plenty of food was available for people with money; it was just that his family was poor. Now 28 and an industrial designer in Chicago, Mr. Ourasanah has tried to startle others into new ways of thinking about food. Last month he won a $35,000 Vilcek Prize for Creative Promise for Lepsis, his handsome prototype for a system that breeds grasshoppers to eat. Mr. Ourasanah understands that many Americans are disturbed by the thought of munching on insects, but points out an advantage. “You can farm them at home, which you can’t do with cattle,” he said, adding that with the world’s population at seven billion and expected to grow to more than nine billion by 2050, we may not have much choice. Today, designers are playing with food in growing numbers. Equipped with new technologies, motivated to solve problems of scarcity, obesity and waste, and encouraged by rocketing culinary enthusiasms, they are recalibrating our ideas of taste while preparing science-fiction scenarios for our kitchens. Once you have reared your grasshoppers, for instance, Susana Soares, a designer and researcher in London, has a plan for what you can do with them. Her Insects Au Gratin project involves grinding bugs into a powder that is mixed with cream cheese or butter and flavorings. “They are a very efficient way of getting protein, if you look at them in a rational way,” she said of her material. But because people are more likely to regard bugs with disgust, Ms. Soares uses a 3-D printer to turn the paste into decorative squiggles or attractive filigreed blobs. “They look like jewelry on purpose,” she said. And when you’re ready to clean the mixing bowl ... don’t bother. 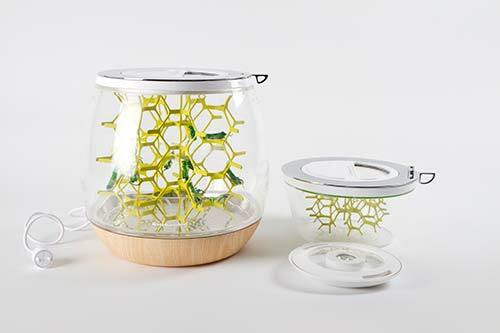 Tomorrow Machine, a design studio in Stockholm and Paris, has partnered with a Swedish materials company called Innventia to sketch out futuristic ideas like dishes that are based on the self-cleaning properties of lotus leaves. The practice of shaping the tools and rituals associated with eating dates from the first use of a twig to tease grubs from a hole, or the first folded leaf used to scoop water from a stream. But only in the last 15 years or so has a discipline known as “food design,” or sometimes “eating design,” emerged.